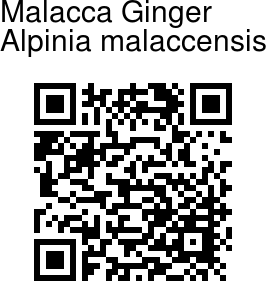 Malacca Ginger is a sturdy herb with pseudostems about 3 m or more. Ligule 2-cleft, to 1 cm, slightly woolly; leaf-stalk about 2 cm, grooved; leaf blade oblong-lanceshaped or lanceshaped, up to 90 x 15 cm, below velvet-hairy, base pointed, tip tapering. 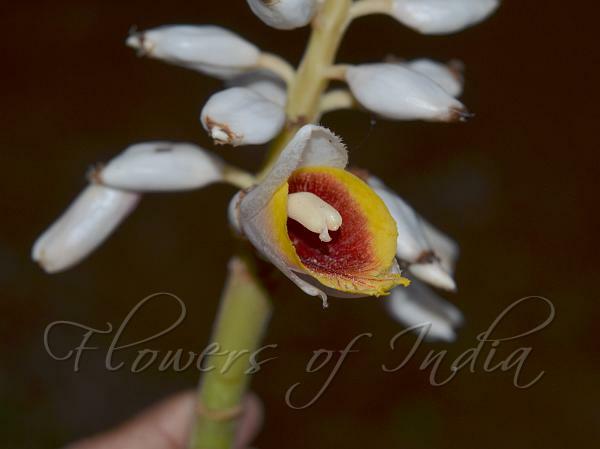 Flowers are borne in erect racemes, up to 35 cm; axis stout, densely yellow velvet-hairy; bracteoles white, broadly elliptic, 3.5--4 cm. Flower-stalk is about 7 mm, densely yellow velvet-hairy. Calyx is bell-shaped, about 1.5 cm, densely silky. Flowers are white, silky; tube about 1 cm; lobes oblong-lanceshaped, 2.5--3 cm. Lateral staminodes absent. Lip yellow with red stripes, ovate, about 3.5 cm, tip notched. Stamen about 2.4 cm. Ovary hairy. Capsule yellow, spherical, about 2 cm in diam., splitting irregularly. Malacca Ginger is a native of Indonesia, Malaysia, NE India. Flowering: April-May. Identification credit: Anurag Sharma, M. Sabu Photographed in Agumbe, Karnataka.